Superconductors.ORG herein reports synthesis of the first 200K superconductor in conjunction with the discovery of a new superconductor system. The 200K material is believed to have a B212/1212C intergrowth structure, where B=11 and C=copper chain. This structure is shown below left and has the chemical formula Sn6Ba4Ca2Cu10Oy. The general formula for this new family of superconductors is SnxBa4Ca2Cu(x+4)Oy. Within this new family, unit cells with 3 to 6 atoms of tin (x) have been found to superconduct, with 6 atoms of tin producing a new record high Tc near 201K. This intergrowth is highly lopsided, as was the Sn-In-Pb-Tm cuprate that produced a 195K superconductor in July 2008. 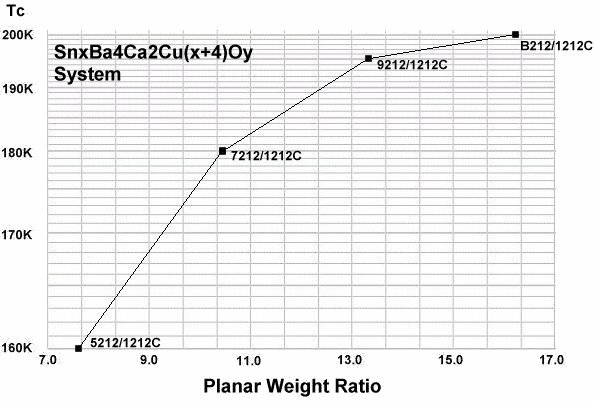 However, it achieves its very high transition temperature through application of planar weight disparity (PWD) in the insulating layers, instead of the CuO2 planes. Above is a composite magnetization test, showing the Meissner transition occuring just above 202K. A flashing line has been added to illustrate the diamagnetic shift in slope below Tc. The quiescent noise is a result of zooming in on a small volume fraction. 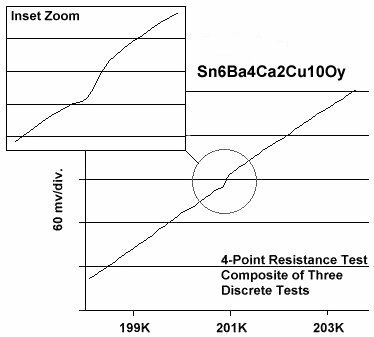 Four resistance tests were averaged and four magnetization tests were averaged, producing a mean resistive Tc of 200.8 Kelvin and a magnetic Tc of 202.4 Kelvin. The first hint that a new superconductor system might exist came in 2006 when three unrelated proto-compounds showed a small resistive "blip" around 160 K. The only elements that were common to these three materials were Sn, Ba, Ca, Cu and O. Through trial-and-error, that 160 K material was finally identified on October 4, 2008, as being Sn3Ba4Ca2Cu7Oy (see below left) with structure 5212/1212C (see below right). This was the first member of the new family of superconductors. 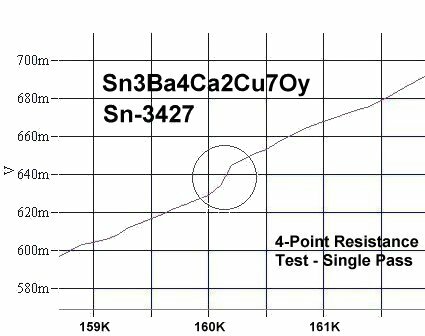 Analysis of the 160 K compound, dubbed Sn-3427, indicated that it could be an analog to the Sn-In-Pb-Tm copper-oxide family that produced Tc's up to 195 K. This became the impetus to add more Sn/Cu layers to increase the unit cell size and attempt to reach 200 K. However, instead of stacking 5 thulium atoms (heavy) opposite a single thulium atom (light), 6 tin atoms (heavy) would be stacked opposite a single copper chain (light). This attempt proved successful as a 200 K minority phase resulted. It may be possible to increase Tc further by doping the molecule with indium (In) or by adding another Sn/Cu layer. However, the increase would only be slight. This is because the inclination of the curve representing Tc-v-PWD becomes nearly flat with 22 layers in the unit cell. 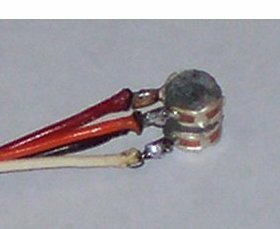 This was seen in the Sn-In-Pb-Tm copper-oxide family and can be seen in the below results as well. Since the 200K material contains only inexpensive and non-toxic elements, a method of refinement to increase its volume fraction is now all that is required for it to become the first commercial superconductor capable of operating at dry ice temperatures. Synthesis of these materials was by the solid state reaction method. Stoichiometric amounts of the below precursors were mixed, pelletized and sintered for 11 hours at 890C. The pellet was then annealed for 10 hours at 500C in flowing O2.